Call of Duty has had a surprisingly stable run on the video game market, despite the cries from gamers that the whole World War II first-person theme is growing stale. Last year marked a new high for the series when Activision debuted it on the Xbox 360 with Call of Duty 2, which became the best release for the system's launch. But a new assault is coming, with Call of Duty 3 set to explode on consoles next month, and a whole new Call of Duty experience coming to the PSP early next year. This new experience is called Call of Duty: Roads To Victory, and although it follows the same theme as previous games in the series, it takes an entirely new route with a tie-in story and plenty of intense battle scenarios. In the game, players control members of the 82nd Airborne Division, both a Canadian First Army rifleman and a British Parachuting Regiment commando, as they embark on separate missions to help fight the Nazi regime and provide an end to World War II. This quest, however, is anything but easy, as the Germans refuse to go quietly into that good night. Call of Duty is normally handled either by Infantry Ward and Treyarch in terms of development, but handling Roads To Victory is Amaze Entertainment, a company that's very familiar with PSP development- they brought us Pirates of the Caribbean and Lord of the Rings: Tactics for the handheld. We caught a glimpse of a halfway-complete build of the game at a recent Activision event, and it looks very intense. The game features well laid-out level details that show true essence of war, complete with buildings shattered from their foundation and German soldiers around every corner. The game is forseen from a first-person perspective, and players can press in the L trigger to get a tighter view from behind the gun barrel to get a better fix on their enemy. The R trigger fires, while the D-pad, analog stick, and buttons all determine movement, use of weapons, and more. Unfortunately, we were not able to get hands-on with this build, but the control scheme looks to be coming together wonderfully. 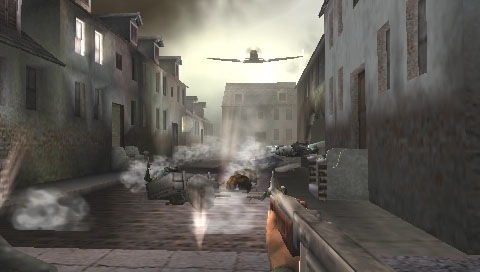 The game also features little changes of pace in the action, letting players get behind a mounted machine gun and also doing a little sniper fire to protect the others in their command. If the default control method doesn't please you, however, the game offers three other schemes to choose from, each with their own quirks that make you feel that much closer to the action. 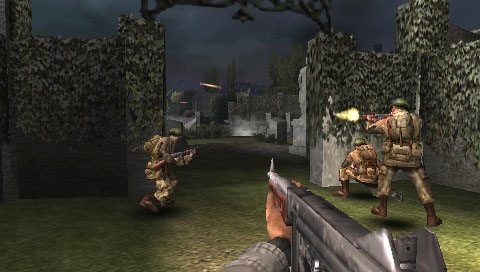 The game is backed with a very competent, fast-moving engine, and authentic war sounds, including a sweeping score, yelling commandos (good and bad), and authentic gunfire effects. The single player mode will offer many unlockables to help boost replayability, including all new weapons that add some further chaos to battles, as well as new artillery, weapons, and other items to help you survive the war. But if multiplayer is what you're looking for, Roads To Victory is wide open for travel. The game will support up to 4 to6 players in different matches, including Deathmatch, Capture the Flag, and King of the Hill, a game where survival of the fittest isn't just a request, it's a demand. Call of Duty: Roads To Victory already has some competition to deal with, as Medal of Honor: Heroes recently hit the PSP and Brothers In Arms is on the way to the system as well. However, it looks like Amaze is doing some damn fine work thus far, capturing all the terrors and havoc of war into one travel-size package. We'll be back to review Roads To Victory when it arrives early next year, so keep your trigger finger warm. Might we suggest Call of Duty 3 for consoles in the meantime?